Why 7? Founder Tyler Merrick came up with the idea of taking the 7 deadly sins (lust, gluttony, greed, sloth, wrath, envy, and pride) and flip them on their head. They work through donating funds from sales of their products directly to charities that support each mission, including A Child’s Right, Blood:Water Mission, Camfed, Children’s Hunger Fund, DTJ, Invisible Children, Partners In Health, Plant with Purpose, Restore International, Samaritan’s Purse, Trees for the Future, Trees Water & People, and World Vision. Their product line is simple: they sell gourmet coffee, gum, mints, T-Shirts and water at their online store or at a number of major brick-and-mortar retailers, including Walmart. To find a retailer near you, check out their retail locator. Each product is emblazoned with a label identifying one of the 7 causes. I had a chance to try out some of their gum and mints. 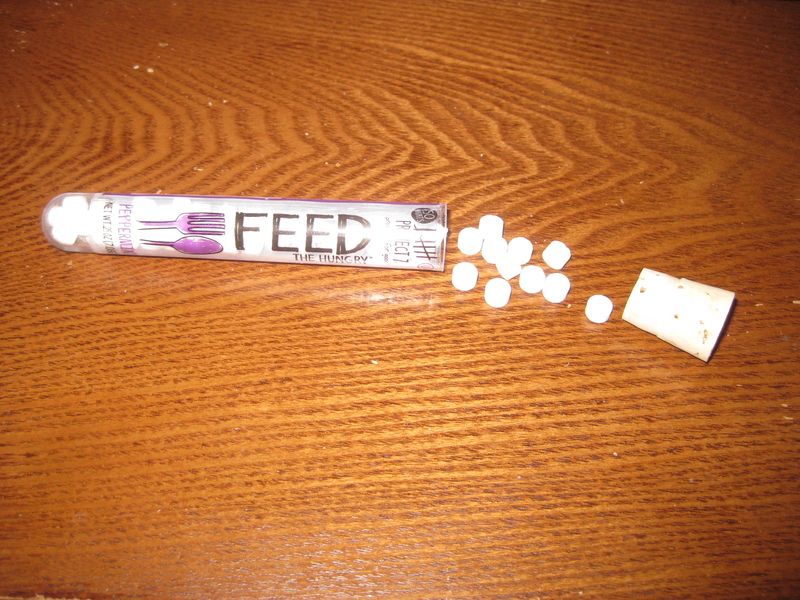 The mints I received were in support of Feeding the Hungry–the package is a very cool “test tube” shape complete with a cork and contains 50 mints. The label reads “Each Tray of ‘Feed the Hungry’ Mints provides 7 meals in American Communities”. 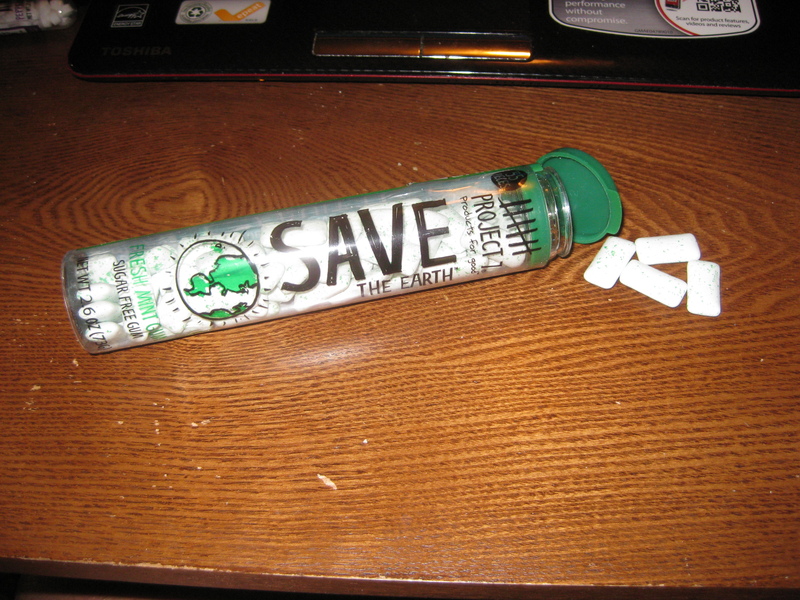 The mints were small, about the size of a mechanical pencil eraser…but boy did they pack a punch. They weren’t just curiously strong–they were undeniably in-your-face strong! I just ate two of them, and I feel like I can blow icy cold air out of my mouth right now. They were among the strongest, most refreshing mints I’ve ever had. 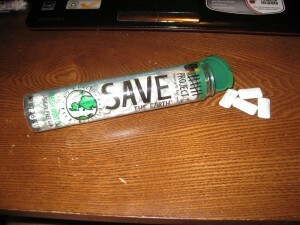 For their gum, I got to try a tube of their Save the Earth gum. The packaging says that one tube plants one fruit tree pack into the earth. 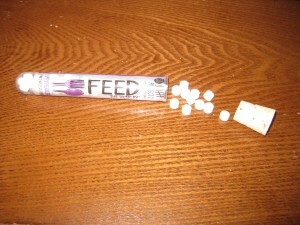 Inside the package are 55 pieces of sugar-free gum. The gum is about the size of a chicklet and is white with green speckles. Overall, I highly recommend these products. If you happen to see a tube sitting at the checkout counter of your local Walmart, be sure to pick one up and you’ll be doing a world of good. If you like the mints, you can also order a bulk package from Amazon .